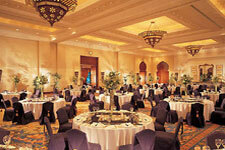 The One&Only Royal Mirage pays tribute to Arabian architecture and hospitality on a truly regal scale. Considered the most stylish resort on Jumeira Beach, it comprises three equally distinctive properties, the original hotel - The Palace - and now the Arabian Court and the Residence & Spa. Already a landmark in Dubai, The Palace of One&Only Royal Mirage is joined by two new and equally beautiful developments - The Arabian Court and The Residence & Spa nestled in 60 acres of landscaped gardens, where the clear blue water laps the beach and palm trees sway in the sea breeze. 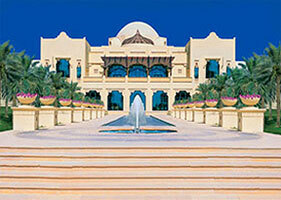 The Palace at One&Only Royal Mirage sits on a private beach offering rich leisure facilities. Temperature controlled swimming pools, water-sports center, tennis courts, golf putting green, children’s care center and most importantly a tranquil haven for rest and relaxation. The Palace has an outstanding array of dining venues, and the Royal Ballroom caters for up to 350 guests and three further meeting rooms offer a complete business solution. All guestrooms are sea facing, with private balcony or garden patio and adorned with ornamental arches, terracotta tiling and custom made furniture. The vivid colors echo the warmth of the Arabian Gulf, while the soft tones recall the desert landscape. The comfort and the accessibility of the various room facilities, such as the mini bar, satellite television, personal safe, room directory, and chest of drawers with freestanding make-up mirror, ensure that the rooms are not only elegant, but also practical. The Executive Suites proportions are very generous, and yet what sets them apart is the degree of comfort, the attention to detail, and most importantly the traditional Arabic theme which permeates every aspect of One&Only Royal Mirage’s design. There is a timelessness about the elegant and stylish beds, the deep pile carpets, the Moorish artefacts and contemporary artwork. The two Royal Suites are very grand with 325m² of living space and feature two elegant independent bedrooms, each decorated with refined colours and textures, as well as luxurious en-suite bathrooms. The spacious and separate living room and dining room are linked to a large balcony overlooking the Arabian Gulf, only 50 metres away. 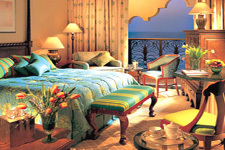 The Royal Suites also include a walk-in wardrobe and private kitchenette. The Gold Club is an exclusive lounge and reception, with a difference. Private entrance and lift access for true discretion, lounge offering continental breakfast, cocktail hour and soft drinks, in addition to a team of hosts, butlers and receptionists which are available around the clock, make this more personable and ‘homey’ area. Two-hundred-and-fifty deluxe guestrooms comprising of two Royal Suites, nineteen Executive Suites and fifty-three Gold Club Rooms with private reception and cocktail lounge. All rooms are sea-facing with central air-conditioning, walk-in closet, luxurious bathroom with separate shower, private balconies or ground floor patios. Extensive private beach with comprehensive watersports and recreational facilities. Two swimming pools, three tennis courts, putting green and a dedicated children's centre are set amidst extensive and spectacular gardens, with sailing, windsurfing, water-skiing, diving and deep sea fishing also on offer. Professional instruction also available. Three themed restaurants providing a selection of Mediterranean, Moroccan and Arabian fusion cuisines, an oriental café offering speciality teas, coffees and regional delicacies, and six bars, including the spectacular Kasbar for animated evening entertainment.